The axes are not well labelled here. 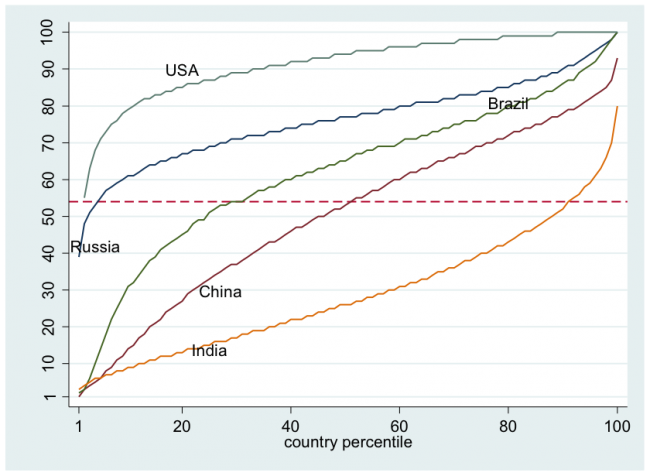 How to read this is the X axis is the income percentile of a person in their home country. Then one reads up, and the Y axis is the income percentile that person would be at for the whole world. So a person who is at the 20th percentile in the USA is around the 85th percentile worldwide. It is interesting that by hugging the 45 degree line, China mirrors the world average. If you want to envision the distribution of absolute incomes around the world, think of China. 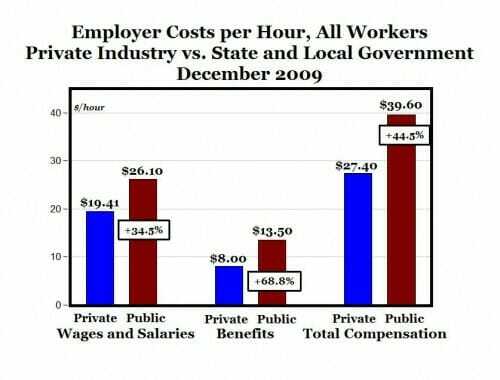 This raises a certain question for American redistributionists. Ayn Rand used to point out that redistributionists always love the idea because they feel like they got to pick the pocket of the guy wealthier than them, forgetting that someone poorer gets to pick their pocket. Essentially, in a truly global redistribution scheme, everyone in the US would be paying rather than receiving. A better way to achieve global income equality would be to have more countries emulate the American rule of law, property rights regime, and relatively free markets. Ironically, most American redistributionists support the opposite, arguing that in many was the USA should emulate the authoritarianism of these poorer countries. Which I suppose will achieve global income equality as well, though in a much less attractive way. 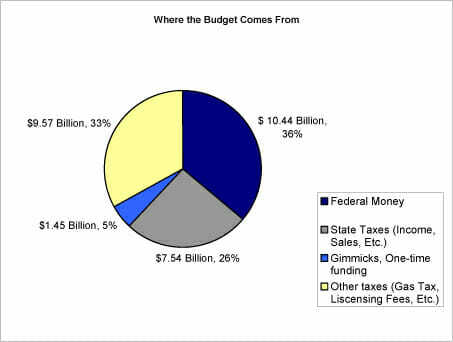 $12-24 Billion is between 0.08% and 0.15% of GDP. This is for a shutdown of the government for 4.4% of the year (16 days divided by 365). That hardly seems like a substantial impact, and not at all in line with the scare stories in advance of the shutdown. (And this is coming from someone who was impacted a lot, though due to illegal actions by the administration). When old guys like me go out to play pickup basketball, we all lay out our excuses before we start playing: My knee is acting up, my job gives me no time to practice, etc. -- you know the drill. So here are my excuses for the following video: I had just arrived in Orlando to run a 10 mile race with my daughter, it was really early in the morning, I was jetlagged, I only had 4 hours of sleep, live TV is hard, live TV from a remote broadcast staring into the camera is harder, my earpiece was loose, I didn't like the questions they asked, etc. Also, I missed it on Monday but I got a brief mention in the USA Today editorial. This is pretty amazing -- a FOIA and a subsequent string of emails between a USA Today reporter and the Department of Justice. Like any email string, you need to go to the end and then read up. Essentially, the DOJ tells the reporter that they have information that undermines the reporter's story but won't tell him what it is. Instead, they threaten to hold it until after the reporter has published, and then give the information to another media outlet in order to embarrass the reporter, all because the reporter is "biased" which in Obama Administration speak means that he is an outlier that does not dutifully fall in line with the Administration's talking points. My guess is that this is a cheap bluff to prevent a story from being published that the DOJ does not want to see in the public domain. Even if it is not a bluff, this is a horrendous approach to releasing information to the public. One of the classic mistakes in graphics is the height / volume fail. This is how it works: the length of an object is used to portray some sort of relative metric. But in the quest to make the graphic prettier, the object is turned into a 2D, or worse, 3D object. This means that for a linear dimension where one object is 2x as long as another, its area is actually 4x the other and its volume is 8x. The eye tends to notice the area or volume, so that the difference is exaggerated. 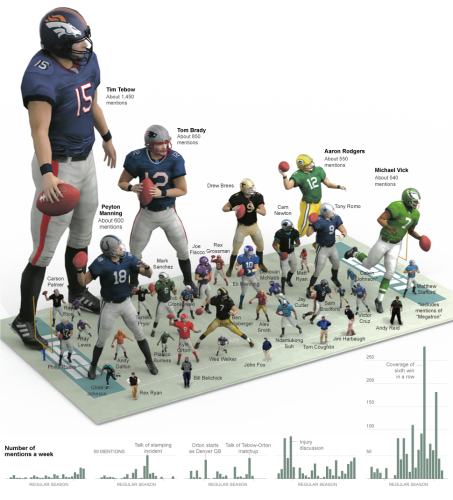 The Tebow character is, by the data, supposed to be about 1.7x the Brady character. And this may be true of the heights, but visually it looks something like 4x larger because the eye is processing something in between area and volume, distorting one's impression of the data. The problem is made worse by the fact that the characters are arrayed over a 3D plane. Is there perspective at work? Is Rodgers smaller than Peyton Manning because his figure is at the back, or because of the data? 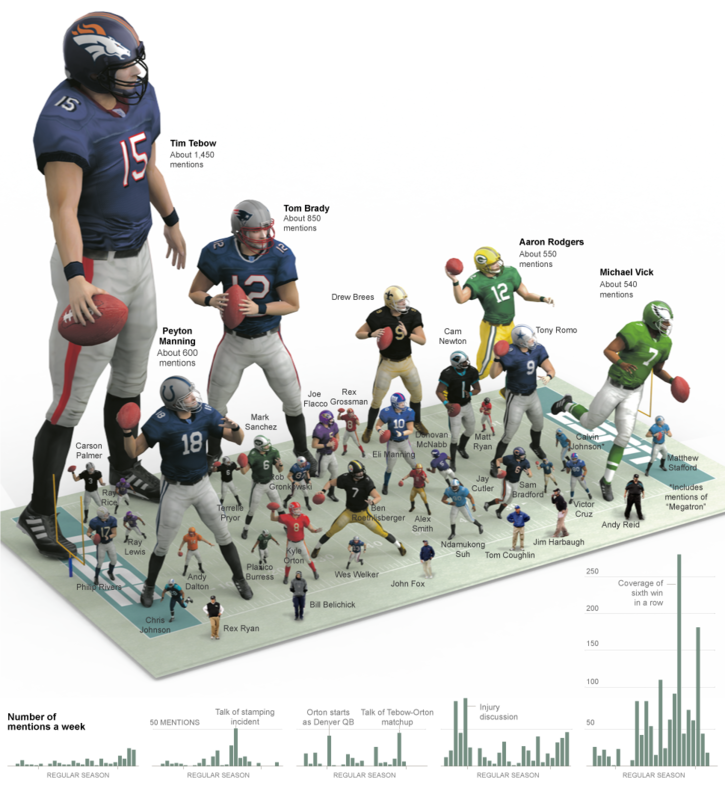 The Vick figure, by the data, should be smaller than the Rodgers figure but due to tricks of perspective, it looks larger to me. This and much more is explained in this Edward Tufte book, the Visual Display of Quantitative Information. You will find this book on a surprising number of geek shelves (next to a tattered copy of Goedel-Escher-Bach) but it is virtually unknown in the general populace. Every USA Today graphics maker should be forced to read it. National security letters strike me as one of the worst Constitutional abuses to come out of the last 10 years, which is saying a lot given the post-9/11 theories of executive authority from torture to indefinite detention to even ordering people killed. The national security letters deserve particular scrutiny because they evade the Fourth Amendment while building in a prior restraint on speech that prevents recipients from challenging the letters or even complaining about them. This is self-sustaining policy -- ie policy that prevents the dissemination of information that might prove it is a threat or a failure -- at its worst. The Justice Department's inspector general revealed on March 9 that the FBI has been systematically abusing one of the most controversial provisions of the USA Patriot Act: the expanded power to issue "national security letters." It no doubt surprised most Americans to learn that between 2003 and 2005 the FBI issued more than 140,000 specific demands under this provision -- demands issued without a showing of probable cause or prior judicial approval -- to obtain potentially sensitive information about U.S. citizens and residents. It did not, however, come as any surprise to me. Three years ago, I received a national security letter (NSL) in my capacity as the president of a small Internet access and consulting business. The letter ordered me to provide sensitive information about one of my clients. There was no indication that a judge had reviewed or approved the letter, and it turned out that none had. The letter came with a gag provision that prohibited me from telling anyone, including my client, that the FBI was seeking this information. Based on the context of the demand -- a context that the FBI still won't let me discuss publicly -- I suspected that the FBI was abusing its power and that the letter sought information to which the FBI was not entitled. Anyone want to bet how many of these things really are national security related, and how many are related to other investigations (particularly drugs)? There are zillions of people involved in these major investigations. There is no good argument against adding one more who is in on the secret - ie a judge - and a lot of reasons to do so. In my post "Attention Gov't: This Is How Businesses Are Created" I brought up the point that government regulations keep the average American from investing in ground floor business opportunities with rules specifying how much money someone must have before they can invest in start-ups (unless the start-up is being done by a friend or family member). Government regulations also prevent start-ups from advertising their investment opportunity. If you need ground-floor investment (as opposed to loans) to bring your business to the proverbial next level, there is a wall of regulation that keeps you from asking for it from the general public and specifies what "sophisticated investors" (the already rich) you can approach and how. Those rules are there to protect us middle class rubes from being taken in by crafty and ill-intentioned businessmen. I contrasted this protection the government so thoughtfully provides us"âkeeping us from making possible bad investments"âwith it's promotion of lotteries and acceptance of casino gambling. Now these people who will not allow an entrepreneur to advertise or promote his start-up in order to get voluntary investment money from people willing to take a risk on the business idea or invention are looking at legalization of online gambling in the USA. I was forwarded an email today, and I can't honestly figure out the source since it is one of those that has been forwarded a zillion times, but at some point it passed through the Arizona 2010 Project. It consisted mainly of pictures of desert areas along major immigration routes that had been trashed by illegal immigrants. This picture is pretty typical. 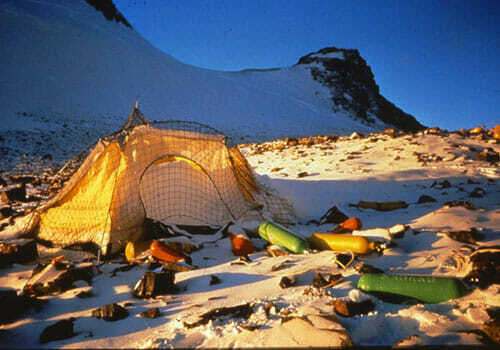 Certainly an ugly site, particularly for someone who lives and works in the outdoors as I do. This layup area is located in a wash area approximately .5 of a mile long just south of Tucson. We estimate there are over 3000 discarded back packs in this layup area. Countless water containers, food wrappers, clothing, and soiled baby diapers. And as you can see in this picture, fresh footprints leading right into it. We weren't too far behind them. As I kept walking down the wash, I was sure it was going to end just ahead, but I kept walking and walking, and around every corner was more and more trash! And of course the trail leading out of the layup area heading NORTH to Tucson, then on to your town tomorrow. They've already come through here. Is this America the Beautiful? Or another landfill? 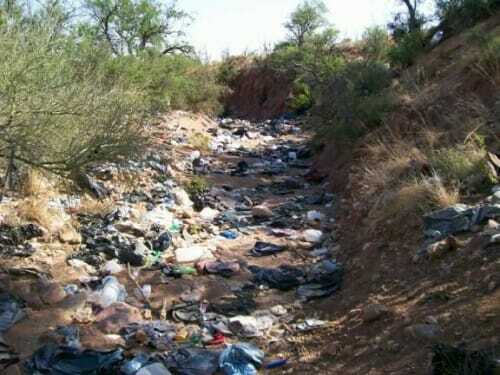 The trash left behind by the illegals is another of the Environmental Disasters to hit the USA. Had this been done in one of our great Northwest Forests or Seashore National Parks areas there would be an uprising of the American people........but this is remote Arizona-Mexican border. We run busy campgrounds and day use areas all over the country, and you would not believe the trash on the ground on a Monday morning. And this is after the place was cleaned on Sunday morning and with trash cans available every 10 feet to throw things away correctly. 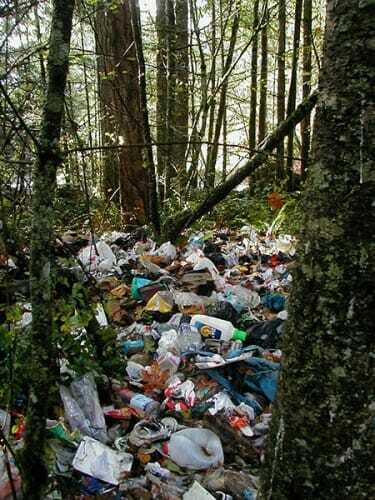 I have seen a few areas in the National Forest that were busy ad hoc camping areas -- meaning they had no facilities, no staff, and no trash cans -- and they were absolutely trashed by good old red-blooded American citizens. Parts looked no different than this picture. Most of these areas have since been closed, because of this ecological damage. In fact, in my presentation I make to public agencies about our services, I say that we are actually in the environmental preservation business. By attracting recreators to defined areas of the wilderness where we have staff to clean up after the visitors and limit their impact on nature, we are helping to preserve the other 99% of the land. All these people that come over, they could come with disease. There's no control, no health checks or anything. They check fruits and vegetables, how come they don't check people? No one talks about that! They're all dirty. I sent out 200 inmates into the desert, they picked up 18 tons of garbage that they bring in"âthe baby diapers and all that. Where's everybody who wants to preserve the desert?" To my mind, this is an argument against Mexican immigration in the same way that violence against women is used as an argument against legalizing prostitution. Prostitutes suffer abuse in large part because their profession is illegal which limits their access to the legal system when victimized, not because violence is inherent to their profession. Trash in a wash in the desert is a result of the illegality of immigration that forces people into stream beds rather than city check points when they enter the country. Postscript #1: Please, if you are a good, clean, thoughtful user of public parks, do not write me thinking I have dissed you. I have not. Most of our visitors are great and thoughtful, and we really appreciate that. But it takes only a few to make an unbelievable mess. Will It Have A Bar? The measure contains funding for a new destroyer and 10 C-17 cargo planes that the Pentagon did not ask for. It also includes hundreds of smaller earmarks for projects of special interest to individual lawmakers, among them $25 million for a World War II museum in New Orleans and $20 million for the Edward M. Kennedy Institute for the United States Senate in Boston, a kind of think tank dedicated to the legacy of the late senator. Maybe its not as bad as it sounds. Maybe its just a driving school. 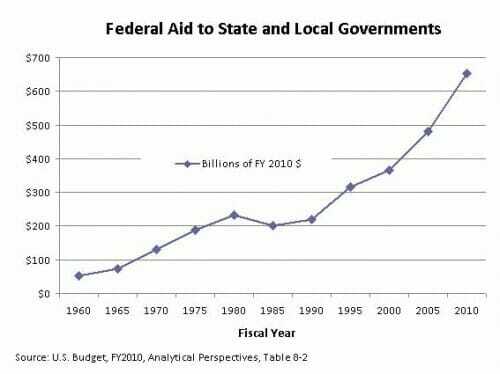 The insinuation of the piece is that the stimulus bill's funding streams are being artfully manipulated or something to disproportionately direct resources toward Obama-loving constituencies....[But] the secret to the riddle seems to be that areas that benefit from federal spending formulae tend to support the Democrats. Not as a result of short-term fluctuations in voting patterns or federal spending levels, but as a structural element of American politics. Actually, that's not quite right. It's weirder than that. I just got around to reading the piece, and aside from the factual statement in the lead, it doesn't insinuate that the money is being unfairly distributed. In fact, every single paragraph after the lead quotes people saying that there's nothing dubious going on and the money is just being distributed by formula. The piece doesn't quote a single person, not even Sarah Palin, suggesting that there's any monkey business going on here. But this does not refute Matt's point as I understand it, that "tinkering" is not necessary because the formulas themselves have been worked over time to preferentially send money certain places. I would use the analogy that there are well worn channels where the money preferentially flows. I must disagree that a story that money tends to flow preferentially (on a ratio as high as 2:1) to Democratic districts should be spiked, as Kevin Drum advocates. I think there is a story in this, though certainly I agree with Kevin it is not the story the author set out to write (one of micro-manipulation by Administration employees). My sense is that the causality involved would be impossible to discover. Does money flow preferentially to these districts because Democrats are better or more focused on bringing home the taxpayer largess to their districts? Or does our money preferentially flow to these districts based on, say, economic or demographic factors that line up well with Democratic constituencies. Or is it, more likely in my mind, a virtuous circle with both factors involved. Either way, this is an interesting story and some interesting new data in our endless red state-blue state analyses. Several companies have been discovered to have benefited from what is in effect slave labor in certain countries. I have never had a problem with folks in poor countries freely opting to take jobs at factories for less money than our privileged middle class attitudes think to be "fair." But there have been examples of governments using their coercive power in a cozy relationship with certain companies, forcing people to provide their labor to companies for wages below what they would freely accept. It is an obscene form of modern slavery. Today's example, though, does not come from Myanmar or China, but from San Francisco, California, USA, where the government is forcing its citizens to work for free to benefit itself and a few favored corporations to produce products for export. toys sold in big-box stores. Anyone really think they are making enough extra money on scrap paper to cover this (at least) $4.5 million incremental investment ($25k x 15% x 1200)? Suspiciously absent from the article is any mention of costs or budgets. City recycling guys have given up trying to defend recycling on the basis of it being cheaper than just burying the material. The city is subsidizing this material a lot. But it's not enough. Even with these enormous subsidies, the city is not producing as much recycled materials to meet its goals. 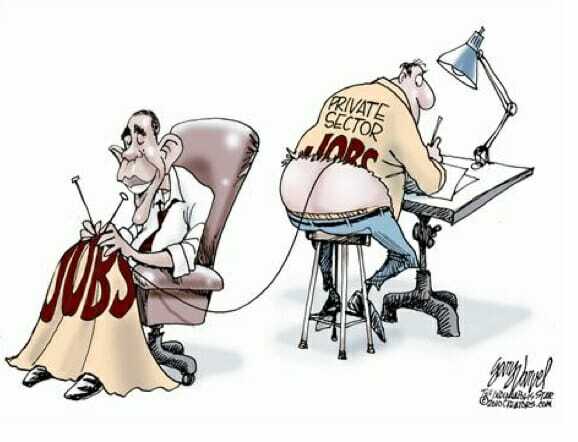 So it is going to make its citizenry provide it more labor. For free. voluntary, on the pain of having garbage pickups suspended. The city is going to coerce every single resident to labor for them each week, just so San Francisco and Norcal Waste Systems can have more scrap paper for export. 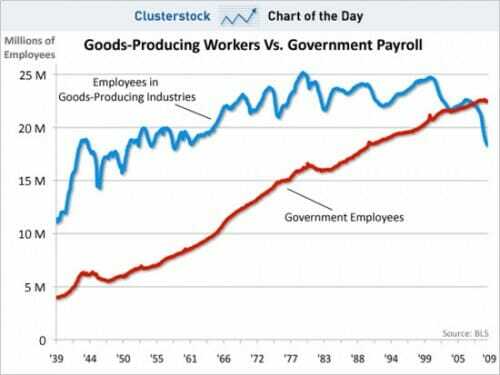 This is a labor tax of immense proportions. I know, whenever I make this point about recycling, everyone wants to poo-poo it. "Oh, its not much time, really." Really? Lets use the following numbers: Five minutes per day of labor. One million residents. $20 per hour labor value (low in San Francisco). That is $608 million if forced labor. I'm not sure even Nike has been accused of using this much forced labor. Nowhere in the article does it really say how this program, or going from 70 to 75% recycling, is specifically going to help the environment. I took the article at its face value, where it justifies the program on the basis of exports and hitting an arbitrary numerical target and beating out San Jose. I am tired of unthinking acceptance of recycling as a net benefit. Every study has shown that aluminum recycling creates a net energy benefit, but every other material represents a net loss. It makes us feel good, though, I guess. Should proponents support the direct subsidy by government and the labor tax, there is still some burden to show that this is the best possible environmental use of 30 million San Francisco man-hours of coerced labor in the course of a year. 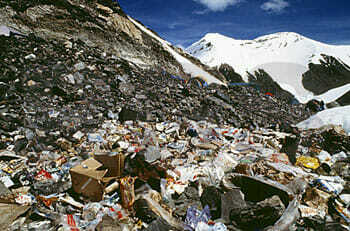 For those really worked up about CO2, explain to me why we shouldn't bury every scrap of waste paper as a carbon sink. The last time I visited, San Francisco was one of the grubbier US cities I have seen of late, with trash everywhere on the streets and sidewalks. It may just have been a bad data point, but are residents really happy the city trash department focusing on scrap paper pricing yield rather than picking up the trash? I class battery and motor oil recycling programs differently. These substances have unique disposal needs and high costs of incorrect disposal. toward the retirement system's looming bankruptcy. Medicare during the next 22 years. 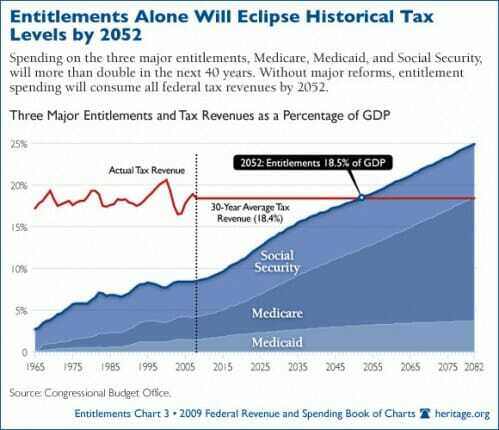 entitled to receive if they waited four more years to retire.